How Many Gold VELD PONDE of 1902 Were Actually Minted During The Anglo Boer War? Lets start a new topic on this subject. Input will be most welcome. I will post something a little later on regarding my findings. We have various minting numbers for the Veld Pond – Elias Levine in his “"The Coinage and Counterfeits of the Zuid Afrikaansche Republiek" :1974: page 70 states “"This pair of dies was the only one used for the striking of the 986 (not 800, as sometimes reported) Veld Ponde"
Where did he get the 800 from I wonder? Who said that? "We had only fairly started to make the crude coins of which enclose is one and all we had made when the British supplanted the Boers in the Transvaal by treaty was 530 coins." We do not know when the letter was written as Cooney left South Africa in 1904 and reports vary on when he actually died – some say 1908 but other reports state 1929. Shortly before the Boer War broke out, he was found guilty of culpable homicide and sent to jail in Pietersburg. That does not make him necessarily a liar but memories fade and one does not know when the letter was written – it was sent from an American address so was dated between 1904 and 1929. It was written to his niece “Maggie” who died fairly young but one has to found out when she died to work out when the letter was approximately written. Technically, the letter could have been written almost a quarter of a century after the end of the Boer War with memories indeed failing. Dr. Landman also mentions a minting number of 525 and other sources states numbers up to 986. It would be interesting if Anthony could shine more light on this very interesting issue that I have just started to delve into. My Observations on the Veld Pond………. The question surrounding the actual mintage of the Veld Pond is one that can be debated for years to come. We have taken the actual mintage to be what Mr P.J Kloppers had said at the end of the Boer War based on his daily tallying and balancing of the Veld Pond and gold that was used to mint the coins. When looking back 114 years, some of the facts look a bit skewed based on what a few people had to say then. Let’s look at some facts surrounding this. (see attachment of a translated hand written letter by Barter. (see attachment of translated hand written letter by Gen Muller. coins out. What is this the reason for this? From historical documentation, we are told that daily balancing of gold given to mint the coins, and actual coins minted, were balanced at the end of each day. So why the discrepency in mintage figures? I can only come to the following conclusion. When peace was declared on 31 May 1902, the coins minted up until that date was between 525 and 530. Why? Because it was the daily count, and balancing as at the end of day and the grand total up until 31 May 1902 equaled to this. General Muller had to leave Pilgrims Rest and head towards Vereeniging to sign the peace treaty. So General Muller would only have record of what the total coins minted was up until 31 May 1902. Cooney, an Irish American who was a spy and was spying on British Forces and also a murderer, knew that the war was over and if he remained in Pilgrims Rest, he knew he would be arrested. It is documented that Cooney also left on 31 May 1902 with General Viljoen and General Cronje to the USA to raise funds and never returned. Cooney would have only remembered the total number of coins minted up until 31 May 1902 which totaled between 525 and 530. Historical documentation also states that even though the war was over, the Staatse Munt Te Velde continued to mint coins up until the 08/09 June 1902. That is 8/9 extra days of minting. The question is, how many coins did they mint during these 8/9 days. Kloppers was the last man standing, he was the one who handed the Veld Pond dies to General Muller on his return to Pilgrims Rest on 10 June 1902. Kloppers was also in possession of the last piece of gold, which was not enough to mint another coin and this he kept as a souvenier. The last time I was up at the S.A Mint coin shop, this was on display in the museum cabinet (on loan from the family). So Kloppers was the man in the best position to know the exact number of Veld Ponde minted due to the extended number of days they continued to mint the coins, and he was there right until the end. This leave us with the unanswered question and more realistic mintage total by W.J.H Barter that about 600 Veld Ponde were minted. It was possible to mint 70 coins in 8/9 days (530 + 70 = 600). So where did Barter get his total from? Barter mentions that these coins were minted between April and May and does not make reference to the 8/9 days in June. Did Barter leave Pilgrims Rest on 31 May 1902 when peace was declared or did he stay on until the 8/9 June 1902? So we have more questions than answers and no concreted proof of the exact mintage of the Veld Pond. Hopefully in the not to distant future, a diary or ledger kept at the Staatse Munt Te Velde will turn up and all our questions will be answered. For now, I guess we have to stick with what Kloppers had said, 968 coins were minted. "According to Kloppers, they continued their work until 7/8 June 1902 and produced a total of 968 Veldpond. It seems as if he interpreted the financial statement of the treasurer wrongly. The value of the raw gold used from 10 May to 1 June plus the coined gold for that period ads up to a total value of gold of ₤967-2-6 which is something different from the total figure of Veldpond coined at the Field Mint." It is a pity one could not make out what is written on the document as it would be very telling. Why does she think that anyone (like Kloppers) would add the two together to determine the number of Veldponds minted? If the Veldponds were nearly 24ct (pure gold), the raw gold and the coined gold must be nearly the same? Why add the one to the other? If ₤967-2-6 of gold was used, then the number of Veldponds minted must be very near that number. It is just a pity I cannot make out what is written on the document shown in her addendum B as that would clear up many things in my mind? Does anyone have a better copy of that document for publishing it here so that it is readable? To deepen the mystery further, the belief that the Veldponde is almost pure gold (24 carat) should be questioned as well. After I recently wrote an article on which historic coins are still legal tender, one of the dealers to whom I mailed it to contacted me regarding these Veldponde. An analysis of the gold content of a number of Veldponde by them using one of these handheld X-ray analyzers indicated that the genuine coins are not 24 karat. I have two test results showing the one coin is 21 carat (87.24 Au, 7.89 Ag, 4.87 Cu) and the other is 20 carat (85.37 Au, 7.21 Ag, 7.42 Cu). We need to test a bigger sample before any conclusions are drawn, but it is definitely worthwhile investigating further. O boy, if it was Cooney’s job to ensure the purity of the gold (he was appointed to the Veld Pond team to purify the gold to 24 carat) and the latest info we have is that it was not near that number, then the Irish American essayer was not only a convicted murderer, but also a blatant liar and fraud who could have siphoned off 15% of the gold for personal gain. I personally am inclined to believe that the 968 mintage figure for the veldponde is more likely to be correct. As Anthony says " So Kloppers was the man in the best position to know the exact number of Veld Ponde minted due to the extended number of days they continued to mint the coins, and he was there right until the end". To me that says it all: Kloppers was there right until the end. 1. Anthony reinforces this argument with: " Historical documentation also states that even though the war was over, the Staatse Munt Te Velde continued to mint coins up until the 08/09 June 1902. That is 8/9 extra days of minting. The question is, how many coins did they mint during these 8/9 days. Kloppers was the last man standing, he was the one who handed the Veld Pond dies to General Muller on his return to Pilgrims Rest on 10 June 1902. Kloppers was also in possession of the last piece of gold, which was not enough to mint another coin and this he kept as a souvenier." 2. Additionally, the SA Mint website says : "An attempt was made to establish a mint at an abandoned goldmine near Pilgrims Rest. Soft hand-cut dies and an improvised fly press were used to strike Pound pieces of practically pure gold to the intrinsic value of 22 shillings. The "veldponde" (field pounds) were exchanged with the burger for their British sovereigns. This facilitated trading with the local residents who would only accept the "coin with the horse on it". With a single set of dies, 986 coins were minted after many trials. Ironically, striking was actually completed a few days after the Boers had conceded victory to the British forces. " (My bold). 3. Re the other sources of mintage figures, I would always trust the words and memory of somebody (Kloppers) who was present right until the end than the memory and words of other participants writing about these events long afterwards. 4.. Dr Rentia Landman's "Addendum B" refers to the veldponde. Whatever it reads, the fascinating figure of £967-2-6 comes up, ie £968. Whether a gold sovereign or an 1892 - 1900 gold pond, each of these roughly quarter ounce gold coins was valued at.....one pound. The production of the veldponde would have been no different, so it would seem to me that 968 veldponde/pound equivalents were minted. I had a brief look at Dr Rentia Landman's piece. On pages 6&7 it's noted that Gen Muller had to ensure that the coinage act of the ZAR was adhered to. This law stated that a pound sterling should weigh 7.98805 grams and contain 7.3244 grams of pure gold. Reference to Becklake is made. This would make up 22 carat gold if I am correct, which is the same as a normal pond. I wonder then why would Hern list it as .999 or 24 carat. One small thing: Dr Rentia Landman's "Addendum B" shows a final figure of £967-2-9, not £967-2-6. Whatever, this provides a fascinating insight into the Boer Governments on the run and its officials still determined to be accountable for their actions and expenditure. QUOTE=Cold Sea;n296118]I had a brief look at Dr Rentia Landman's piece. On pages 6&7 it's noted that Gen Muller had to ensure that the coinage act of the ZAR was adhered to. This law stated that a pound sterling should weigh 7.98805 grams and contain 7.3244 grams of pure gold. Reference to Becklake is made. This would make up 22 carat gold if I am correct, which is the same as a normal pond. I wonder then why would Hern list it as .999 or 24 carat. "To comply with the requirements of the ZAR Coinage Act (Act no 14 of 1891) Cooney had to purify the gold to 24 carat. For a better product, silver was added and for which 11/6 was paid". If 11 shillings and a sixpence were paid for silver and that silver was added to the total amount of gold used then it would not really make a big difference to the purity of the gold. That means that less than 12 shillings of silver were added to over 21 000 shillings worth of gold. The gold purity then still has to be very much near to 24 carats, but according Ni28s post, it was at least 15% less according to the tests that have been done recently. I really smell a rat somewhere? I hope someone with more knowledge will jump in here. From a 1925 paper by Pearson, the then deputy mint master, gold bullion leaving the mines contained as much as 50 - 60 per cent base metals and silver. The cyanide method was used to further refine this gold. This was developed in 1887 partly because of the type of ore found at the Rand. After the cyanide process the bars would generally be 85-90 percent gold, 8-10 percent silver with varying quantities of base metals, lead, tin, zinc and even platinum etc. Pearson goes on to explain other processes to further refine the gold. Maybe Cooney never had the means to do this. The copper would have been added on purpose, and my guess is to reduce the gold content to 22 carat as allowed by the Coinage Act. My understanding is that the gold had to be 24 carat before adding the copper. As Ni28 says, more tests might be interesting. I will always go by 986. Just FYI: NGC has now added "details" coins to their population report. There has been a total of 154 Veldponde graded with a numerical grade, and a further 112 with a "details" grade, either being ex mount, polished etc. So only about 70% of Veldponde submitted for grading, actually grade with a numerical grade. I am sorry to say, but Landman's piece has a few inaccuracies that places doubt on her research. Firstly, it seems as if she does not know the difference between pure gold (24ct) and 22ct gold (the gold content of British sovereigns and ZAR Ponde). (That means that the act requires the coins to be 91.66% pure which is 22 carat). So Landman tells us that Coinage Act of the ZAR (no 14 of 1891) requires ZAR gold coins to be 22 carat but then a few pages later tell us that the same act requires it to be 24 carat. Field Cornet AEG Pienaar told him that the Commando was in possession of gold to the value of £500. I am not sure if they received that as payment or if that was the amount recovered from the plates, but it seems like it is the former, but even if it is the latter, one would guess that another 2332 grams of pure gold (if the amalgam was say 50% pure) was available which would add enough gold for at least 300 more Veld Ponde - that gives us 800 plus coins in the worst scenario. Eli Levine :1974: 70, actually mentions the figure of 800 see my post above, but says it's wrong he maintains it's 986. If Cooney was paid a third for the gold he recovered from the plates, and Rothmann and Waldeck received the same percentage (33.3%) then the total amount gold recovered was indeed much more. I hate to say this but I agree. Dr Landman states in her piece that no bar gold was used. However, in Becklake's publication, The Coinage of the SA Republic, to which she refers to a couple of times, Kloppers clearly says that "I printed 'blue backs' at Pilgrims Rest and made bar gold into the ZAR Veld-Ponde that you know". Becklake also states that the gold used was refined to the greatest extent practicable with the equipment available (not 24 carat). Dr Landman's article is very informative, but not complete.I am still to make up my mind about how many were minted. Secondly the rest of the ₤967-2-6 (amounting to ₤467-2-6, - the £500 worth of gold coins being subtracted) was made up of the raw gold that was scraped from the old plates. Unfortunately, we do not know if that ₤467-2-6 constitutes unrefined gold or pure gold. So if it was unrefined (say 50% pure) we have an extra ₤233 that can be added to the £500 OR if it was pure than we can add ₤467 which gives us two possible totals of approx. ₤733 or ₤967 worth of Veld Ponde but NOTHING near the 525 mentioned? Lastly, I have read somewhere that a THIRD source of gold was added to the total available gold to mint the Veld Ponde and that was the gold that was actually mined locally during that period at Pelgrim's Rest - does anyone know if the Boers actually mined gold there during that last few months of the Anglo Boer War? If so, we have the commando gold coins PLUS the scraped gold PLUS the mined gold. As a second thought, why would the Boers have 500 gold ponde or sovereigns melted up just to have them re-minted as coins (Veld Ponde) again? So I am truly at a loss at what Dr. Landman is referring to -- maybe someone has her contact details and can ask her to join us here?. Hi Pierre, we are slightly off topic, but I'm sure Anthony won't mind. On the topic of blanks, Kloppers says that he visited the Government, who were travelling with the commandos from district to district at the time, at Steenkampsberg. According to him they had no more coined pounds nor blanks, but only bar gold and "blue backs' which were printed at Pietersburg. This was before they started minting at Pilgrims Rest. Levine also makes no reference to blanks and coins. On a worrying note. I also tried to get a copy of an original letter written on the same topic from the National Archives this week. The item was logged as available, but sadly it was missing from the file. They will look into it next week, and hopefully it was just moved to a different location. I am not sure if Dr Rentia Landman’s website was amended since Anthony started this thread, but now the number of veldponds minted (according to her) is not 530 anymore but it is now officially 650. "Towards the end of the Anglo Boer War, the Boers experienced a critical shortage of money with which to buy provisions for the Commandos. 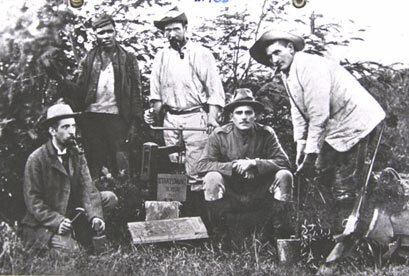 At Pilgrim's Rest a group of Boers, consisting mainly of pro-Boer foreigners coined, according to the latest information that came available, 650 gold pounds, the so-called Veldpond, in the workshop of the Transvaal Gold Mining Estate (TGME"). What happened to the 530 Veldponde we were originally informed (on her website) were the correct number? Now it is 650. She also tells us that the Coinage Act of the ZAR (no 14 of 1891) requires ZAR gold coins to be 22 carat but then a few pages later tell us that the same act requires it to be 24 carat. Dr. Landman is a genealogist (family-history researcher) but with all due respect, numismatics is clearly not her field.